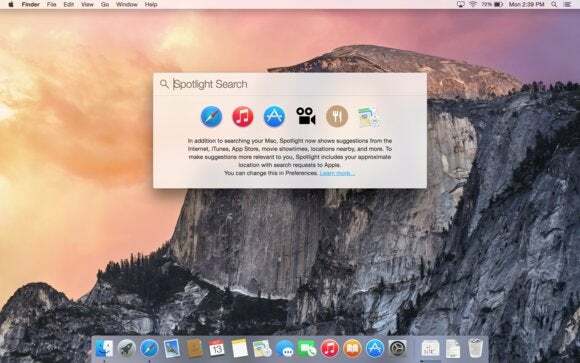 A reader asks for help limiting Spotlight searches in Yosemite, but does Spotlight search other users' accounts? Spotlight searches on my MacBook Pro running Yosemite always reveal files on other users’ accounts. If I put the other users’ home directory into the Privacy section of Spotlight in System Preferences, then those same users are unable to enjoy the convenience of smart mailboxes in Mail and other conveniences of Spotlight when they are on their own accounts. Is there a way to tweak Spotlight from revealing the contents of other user accounts? I looked for documentation or other complaints about this issue, and was unable to find any. I tested whether I could replicate this on my own system, as I don’t routinely work on computers that I share with others. I created a test account and then a text file that had the unique word “fandangobus” in it. I assure you that I’ve never seen that word before, as it doesn’t exist. After testing that Spotlight could find that word in the account in which the file was created, I then returned to my main account—which has administrator privileges enabled—and Spotlight didn’t show the results. The unique word in a text document in one user’s account creates a Spotlight match while logged in as that user. Searching for a unique word from another user’s account produces no matches. My understanding is that Spotlight is designed to prevent this kind of cross-account reveal, but it’s possible something is off in Scott’s configuration through an upgrade or permission changes. Have other people seen the walls break down between multiple accounts on the same Mac through Spotlight searches? Let us know, and we’ll try to troubleshoot this further.